Appeler ces barbelés meurtriers aux lames aiguisées comme des lames de rasoir fil accordéon est un euphémisme quelque peu extrême. From the Washington Post (reg. req’d I think; you can also try to access the article via bugmenot). National Guard crews are setting up double rows of coiled razor wire in front of the tracks and will continue to do so until the fencing blocks the ravaged coast for 30 miles. The razor wire will block the beach fronts in Long Beach, Pass Christian, Gulfport and Biloxi, which are devastated not only south of the tracks, but also well north of them. “We don’t know what washed up from the sea, from the Gulf,” [Col. B. Joe] Spraggins said at a news briefing Saturday. The area may hold bodies of hurricane victims. “We need to be able to find them without having their remains displayed to the public,” he said. 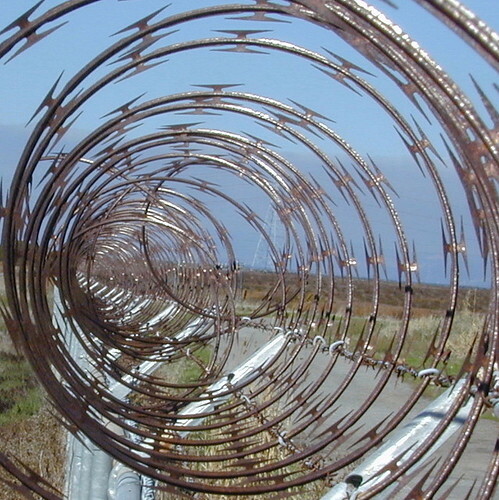 He also said that the razor wire — he prefers to call it by its prettier name, concertina wire — protects what is left of residents’ belongings by thwarting potential looters. There’s also a photo next to the article. And here’s another one, which is not behind a registration wall. All I can say is that you need a hell of a pair of gloves to play that concertina. Found it on Glaukôpidos, via caelestis at sauvage noble, so here it is, as promised: the original Greek version of the “new” Sappho poem found on an University of Cologne papyrus. τὰ δή ποτα λαίψηρ’ ἔον ὄρχησθ’ ἴσα νεβρίοισι. χρόνωι π̣ό̣λ̣ι̣ο̣ν̣ γῆρας, ἔχ[ο] ν̣τ’ ἀθανάταν ἄκοιτιν. Time to bring out the big dictionary (well, my good old school Gemoll) and to brush up on metres. After some discussions in Language Hat’s welcoming lounge, two transcription errors have been corrected. William wryly remarks on textual corruption going on before his eyes. Caelestis has more yet, including a transliteration in our Latin alphabet. Also, he’s the classics scholar, so go there for any of your classics needs. Some dabate has arisen about the meaning of ἰόκολπος, an adjective that modifies “of the Muses”. West’s translation in TLS (copied here) has “fragrant-blossomed”. But the Reuters wire based on it chose “fragrant-bosomed” — which seems more correct (”the bosom [scented with] violets”). Others prefer a different supposition about the origin and translate “purple-girdled”. And for German speakers: deutsche Übersetzung des Sappho-Gedichts, with comments by one of the discoverers, Michael Gronewald (Uni Köln). Related posts: Absence / Presence, and a new poem, Minimalist Kitkat, Carnival of Blog Translation, Le projet de loi sur le « trou analogique » imposerait une loi secrète, Euphemism of the day: concertina wire, More Scots, Do you want some Wood flower picks sea cucumber hoof with your Cowboy leg?